I have been a busy lady prepping for a show. And, I always make so much and then don't take the time to stop and take pictures for you. For this show I only managed to take pictures of a few things. One was this barn door inspired hall tree. This isn't actually a barn door, but it is made from barnwood and the cross piece of wood reminds me of a barn door. I attached the wood pieces to a shipping crate that was left at our house when we moved into it. I added a shelf on the horizontal piece that joins the three barnwood pieces together. I rusted some hooks in vinegar, hydrogen peroxide, and salt. I made a lid for the shipping crate. I did reinforce the top inside edge of the crate with 1"x 2" boards. A coat of Minwax polyacrylic brought out the beauty of the wood. Here is a picture from my booth, showing some of the projects I didn't get pictures of before I loaded them up. I love the rustic charm of the tree. And it looks very practical as well. Sure wish we had room for a hall tree as it looks to be fairly simple to construct. It looks really great without any fancying done on it, rustic? Looking at photo of your booth, love style of benches, sure wish could attend show to visit your booth. 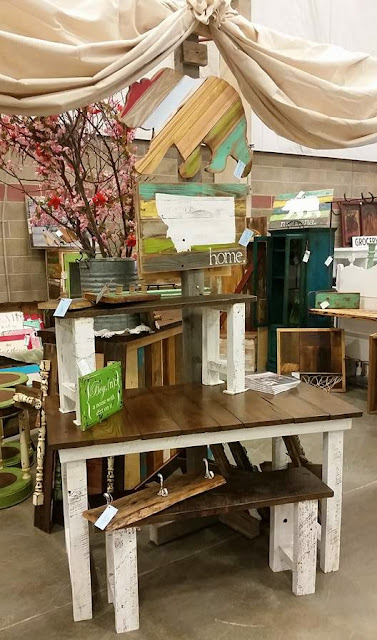 We have made some of your pallet projects from when first found your blog, used pallet wood. People here don't seem to like more rustic items. Hubs got tired of making things nobody would buy. Having place to store items is big problem for us with no garage or basement. Happy weekend and good luck at your show. Your blog is very impressive….